One month almost down in 2016 with only eleven more to go. Where does the time go when you're having fun? 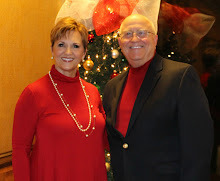 You can always count on fun happening with Joyce on the Hodgepodge, so click HERE and join us. I suppose the most vivid memories would be of standing in front of the large space heater in our parent's bedroom/family room and toasting one side before turning around to toast the other. I also remember hanging clothing in front of the heater to dry because there was no dryer other than outdoor clothes lines at that time. I know I am really telling my age with this answer, but that was life in the rural south in the late 40's and early 50's. No snow stories for us! I have never been one for New Years resolutions. I do however, recommit myself to doing better those things I may have slacked on and continuing the things that I have been doing well. I guess it is a time of reflecting although certainly not a time to dwell very long on either successes or failures because each day is a new opportunity to begin again. I see more potential in my life and pray for the Lord's blessing and direction for every day. Hubby and I have been recording and watching a program "A Football Life" as time allows. We have enjoyed seeing these athletes, some old ones, some deceased, some still alive and active, most of whom we remember from past football glory days. Although there is much to admire and appreciate in these men's lives, I am going to go with an athlete who is very near and dear to our heart; our grandson. Jackson has been consistent these past few years to dedicate himself to his skill on the football field and in the classroom as well. This past year he was ready to step into a leadership role at center when needed then to move into a position he had never played - left guard on a night before a national TV audience against the #1 ranked team in the nation - Ohio State. He not only played well, he played exceptionally well and added the much needed stability to the offensive line. He has played with integrity and grit all year, getting only one penalty. He was the one to always assist a fellow player off the ground and pat those who did well. He never talked trash to the defensive line in front of him, but made his presence known to them by his strength and physical power. We could not be more proud of our Big Boy for stepping up and digging deep this year to make a tremendous difference to his team. As a result of his and his team's effort, they brought a lot of recognition and honors to their school and coaches as well. Jackson was accepted into the highly acclaimed Haworth College of Business this semester as a Junior and continues to excel academically. Jackson, this next year is your opportunity to again step up, dig deep and be the leader on the big, tough offensive line for Western Michigan University Broncos. We love you #65!!! Sour cream on a baked potato would be my favorite. I have not had the clotted cream on a scone, but love the combination of whipped cream and lemon curd on a scone. That would be on the plane leaving the Bahamas on Dec. 26. We were kept on the tarmac for over an hour which bumped us off the connecting flight to Chicago. I try to cope by seeing that everything in my life is ordered by a Sovereign God. I may never know why things happen as they do; however, what is beyond my control is being controlled by a loving and omnipotent God. You were only a collection of days! I started my Monday "Love Your Home" series with two very different homes. If you missed them, you can find the 2nd one HERE with a link to the first at the bottom. Check back next Monday for #3. My little 9 year old Dallas granddaughter attended the birthday party of a classmate last weekend. 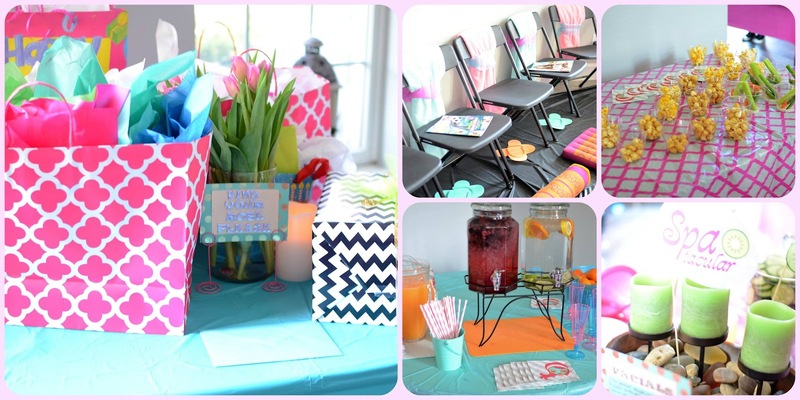 These mothers are so clever in creating fun and different themes for parties these days. This one was a spa theme held in the honoree's home and they left nothing undone. 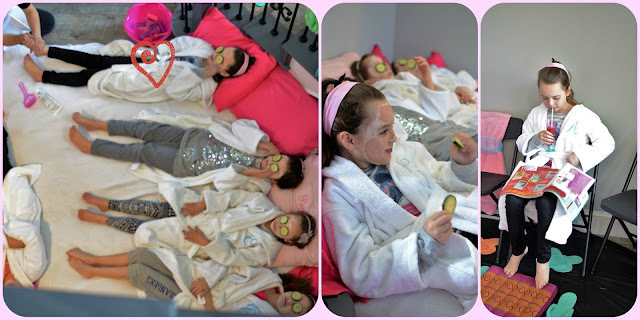 Each young lady was asked to find her own monogrammed robe draped over an awaiting chair where she would be pampered with facials, foot rubs, mani/pedis and hairstyles. There was not a birthday cake to be found but rather healthy snacks and a lot of fun. They were given the royal treatment for sure. I love that Ava Grace found a more practical use for her cucumber slices. I think having one of these for lady friends would be a great way to celebrate a birthday. Except that most of my friends would have a problem getting up off the floor. HA!!! The housing world is made up of two kinds of people: Those who love old houses and those who don't. I want you to meet two people who do! 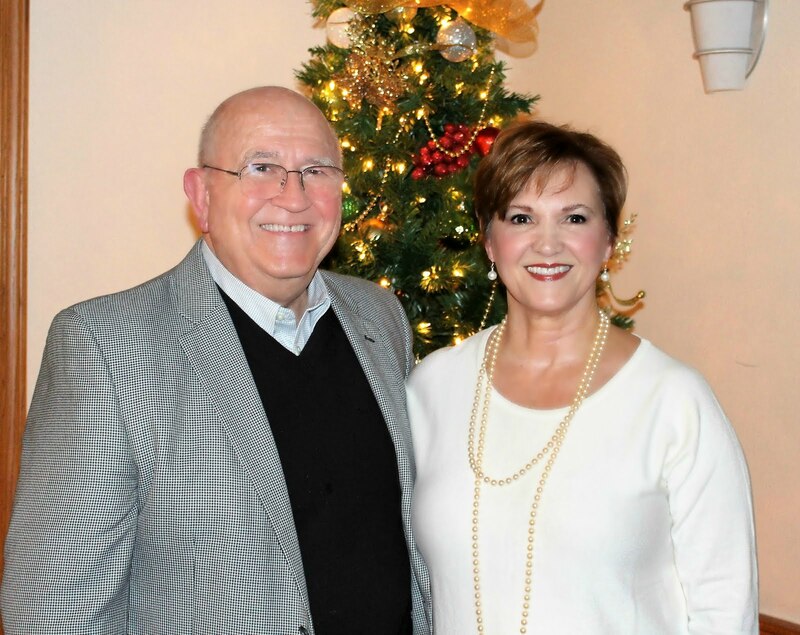 Karl and Judy have always loved old houses and many trips have been spent just looking at the southern plantation homes of Louisiana. In fact, Karl has a sizable collection of plantation prints by the well-known Louisiana artist, James Kindrick III and they can be seen throughout their home. It was this love for old houses and old things that led them to step into the house they made home several years ago. This beautiful, stately home, situated in the Historic South Highlands District of Shreveport represents their interests in preserving family, local, state, and southern history. The home was built in 1922 by William Rex Hirsch after whom the Hirsch Memorial Coliseum was named in 1954. Mr. Hirsch was the president, treasurer and manager of the Louisiana State Fair and it was on those grounds that the largest building in the city at that time was built. 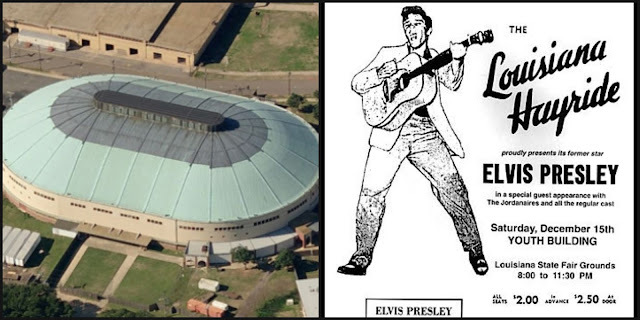 This building also carries its own fame as being the site in which Elvis played for the Louisiana Hayride in both 1955 and 1956. It was known locally as the Youth Building. The homeowners consider themselves preservationists and not renovationists. They have not tried to preserve the era in which the home was built; however they have chosen to preserve their own family history and interests while preserving the integrity and character of the original home. The beautiful brick, ionic columns, and molded plaster work on the exterior are eye-catching details. The theme found on the outside of the entrance above the door, the fleur de lis, is also a theme carried out throughout the home. In fact, while re-plastering and painting some of the interior walls, Judy made sure that every room contained this insignia. Most everything in the house is original. Previous owners did add the heating and cooling systems and enclose the back porch. The original hot water heater and incinerator are still in the kitchen though not functioning due to city code restrictions. 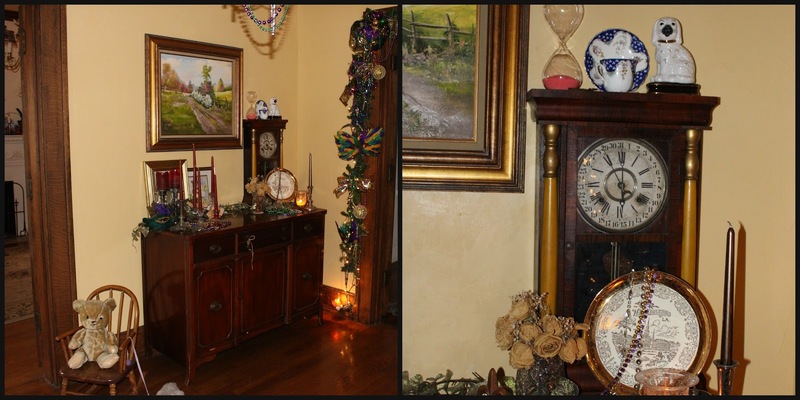 The front door, bedecked with a Mardi Gras wreath invites one into this warm and charming Southern residence. The spacious foyer sets the stage for the remainder of the home. The beautifully maintained original hardwood floors are the foundation for a space full of character and personality. 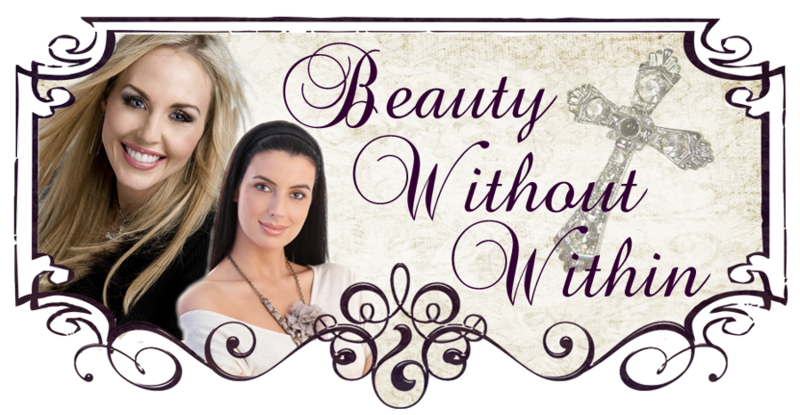 Vintage and precious heirloom pieces, most of which were given to them by family and friends, all have a story behind them. There are so many eye-pleasing vignettes. To the right of the foyer is the large dining room. The table belonged to Karl's mother and the chairs were Judy's mother's. The lights located on two of the walls are original and still work. The painting (below left) came from an old boarding house in the city. 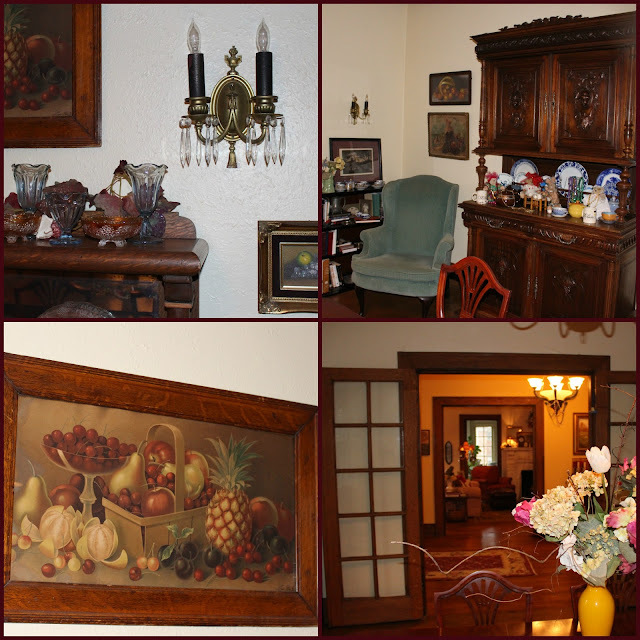 There are so many collections of family pieces and keepsakes from past generations. The pie safe below belonged to Judy's mother as did much of its contents. Across the foyer is the living room. 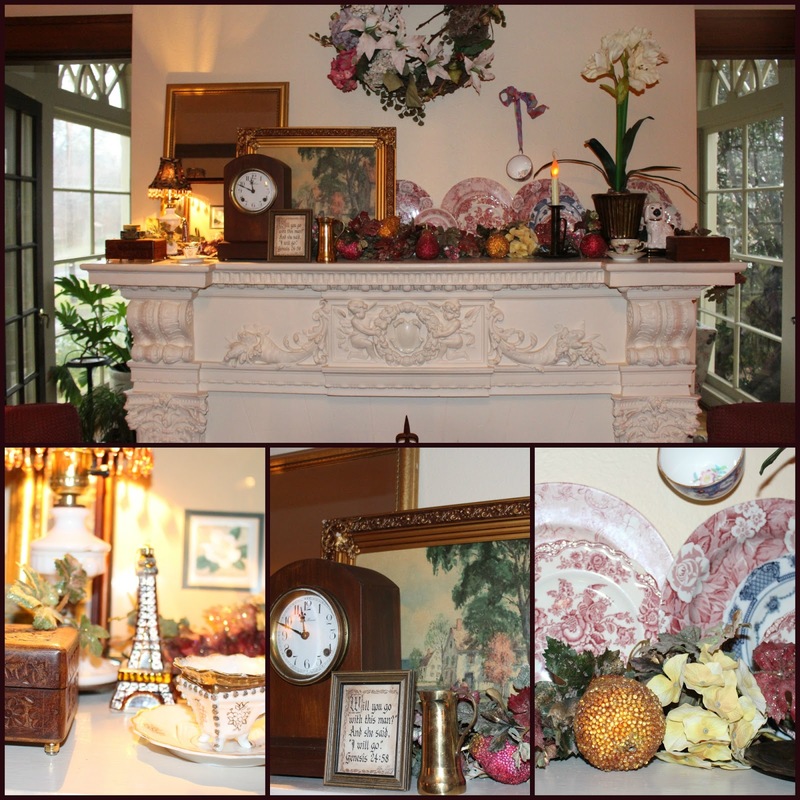 Judy says her tastes and decorating style is more European, specifically French Country more than Americana. She and daughter Megan, both love shabby chic and you see that influence very heavily in this room. Beautiful french doors close off the foyer completely when necessary. One is invited into this cozy space by soft lighting and overstuffed furniture. The room is layered beginning with an old textured, muted toned rug, neutral upholstered sofas and antique wooden furniture pieces. But, there is no way to miss the focal point of the room, the fireplace. This ornately carved plaster fireplace surround is one of my favorite things in this house. One of the most noticeable characteristics of Judy's decorating style is how she uses layers in displaying accessories. 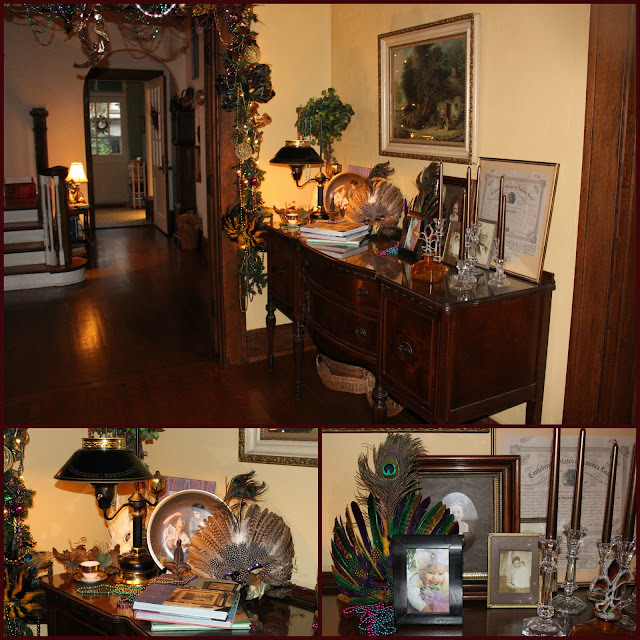 She has a gift for using every available space as a display of memorabilia, family pictures, books, souvenirs, and collections. Every nook and cranny is a treasure trove. 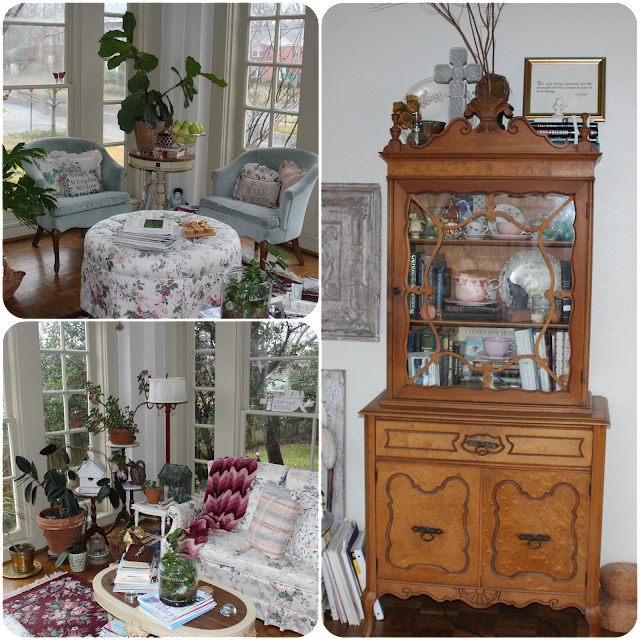 One corner contains her mother's china cabinet with a display of birds one of which was carved by her grandfather and another by her son. The opposite corner of the living room contains two of Karl's Kindrick plantation prints and a round table laden with family snap shots. This comfortable space is where the homeowners host a weekly Sunday evening prayer group of which Hubby and I are happy to be a part. 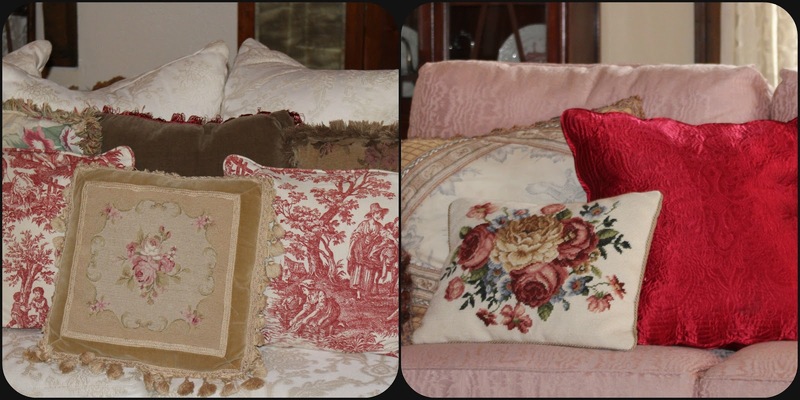 The French Country touches are most evident in the needlepoint, toile, chintz, and tapestry throw pillows. This little cozy nook showcases one of the four original lights in the living room, again repeating the fleur de lis in its design. On this same wall is an old chiffarobe that Judy inherited. On top are actual platinum recordings of songs written by her grandfather, Ed Pagan. You may recognize these titles: "My Blue Heaven", "Baby Makes Three", and "Molly and Me". Molly by the way, was Judy's grandmother. He sold all of his music to Gene Austin who recorded them. Her grandfather was also a violinist and played on these recordings. I find it sad that history will never give credit for these cherished old songs to their rightful composer. The old handmade zither above has been passed down in Judy's family for many generations. On each side of the fireplace are doors leading into Judy's (and mine) favorite room in the house. 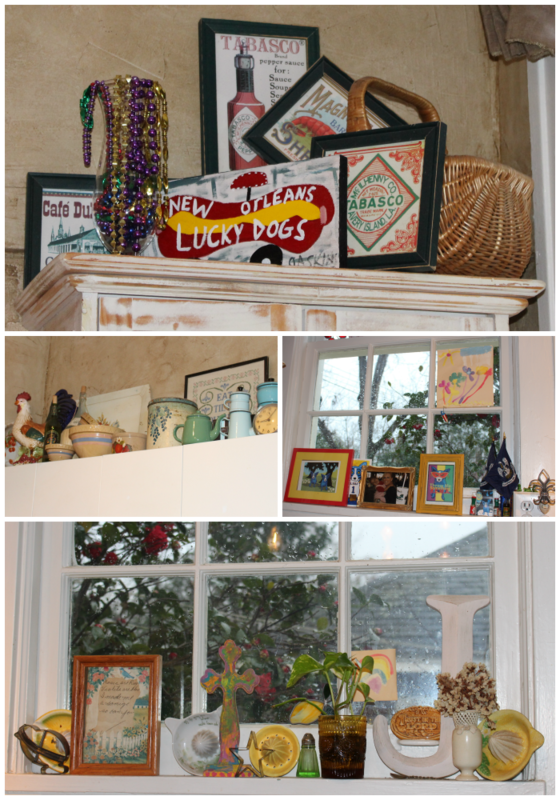 The sunroom perhaps reflects Judy's personality more than any other room, except perhaps the kitchen. It was a cold, rainy day outside when I took these photos and Judy and I were tempted to just sit and enjoy the weather in this cozy, beautiful spot. The windows are amazing architectural bonuses. Beyond the foyer is the hall that leads to the stairway, breakfast room, kitchen and back porch. There is a much unexpected surprise in this space that became a blessing for these homeowners. A few years ago both Judy and her daughter experienced serious heart problems and surgery that made climbing stairs to the bedrooms impossible. Thankfully God had given them this house that contained an elevator. Now, the family member who most enjoys it is Caleb. Across the hall is the family breakfast room. The hub of the house is the kitchen with its original stainless steel counter tops. The original cabinets burned in a fire and were replaced with typical 40's metal cabinets. The original hot water heater can be seen in the far right corner. Karl's mother's old roaster is still usable and provides much needed storage in the bottom. The homeowners love the juxtaposition of the modern light fixture left by a previous owner against all the old in this kitchen. 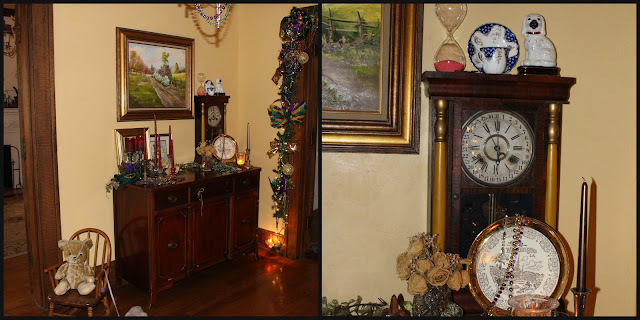 The overall theme of the kitchen is New Orleans and one can see that reflected in so many ways in the collections and displays found above cabinets and on window ledges. Remember, no surface is off limits in this house. Just off the kitchen, is the enclosed back porch which has become a play room for a granddaughter and office for Judy. The old typewriter was given to Judy by a dear friend and is like one that had belonged to her father, who also made the cabinet in the corner. The high window ledge holds Karl's prized bottle collection. His favorite is this old brown Crush bottle found and given to him by a friend. The New Orleans theme is further carried out by this George Rodrique Blue Dog print. One of the things I love about the two houses I have featured so far is that they have showcased what they love and makes them happy. Their homes are reflective of their everyday lives from kid's framed artwork, books, decorative plates, glassware, collections, and inherited memorabilia. This is a four year old granddaughter, Sarah Grace's interpretation of Jesus with the Children. I love it! The beautiful staircase leads to the second floor and bedroom level. 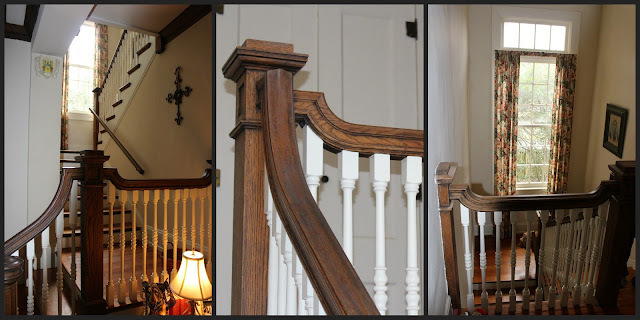 The woodwork is perfectly preserved. 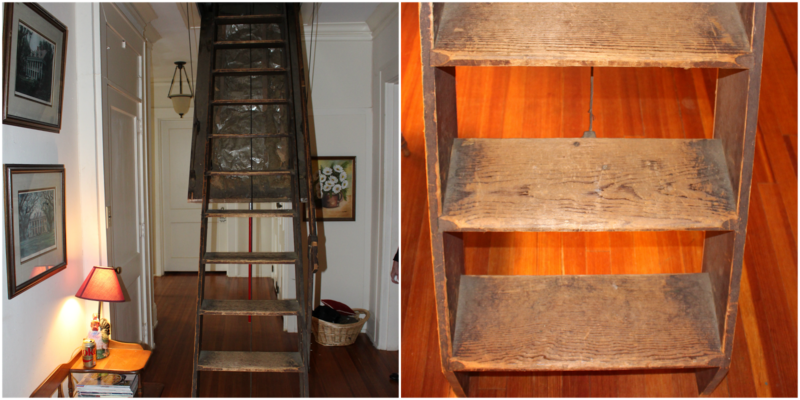 Karl showed me the old original attic stairs that lead to an enormous space of exposed aged wooden rafters and an opening to a once existing widows walk. It was closed off when the roof was redesigned several years ago. 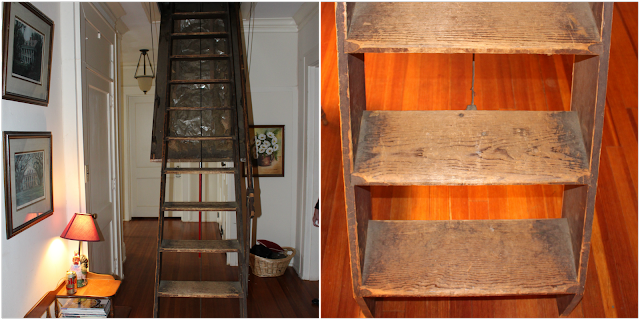 These stairs still work amazing with the original cast iron mechanisms. The well worn solid wooden steps hold so much character. 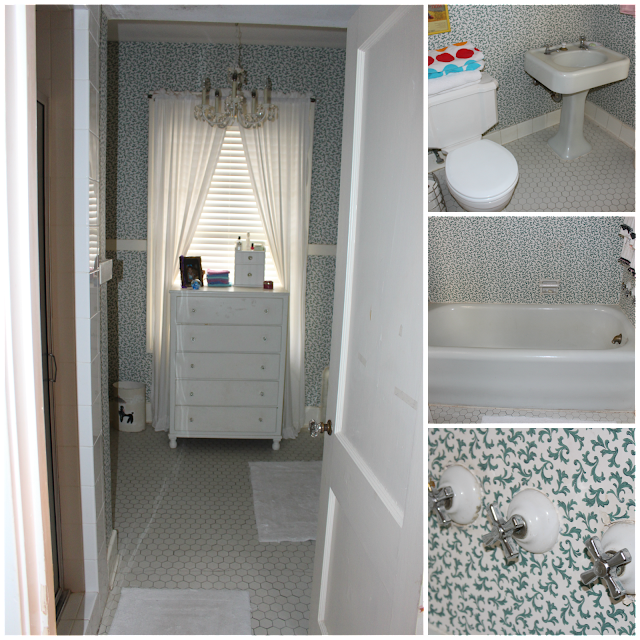 The bath rooms still have the original fixtures and tile flooring so typical of homes built in the 1920's. There are five spacious bedrooms and a windowed craft room (above the sunroom) on this level. In the master retreat, Judy has created a space that accentuates the home's peace and quiet. A room where furniture pieces don't overpower its serenity. This is a large house, but every room feels comfortable and welcoming. 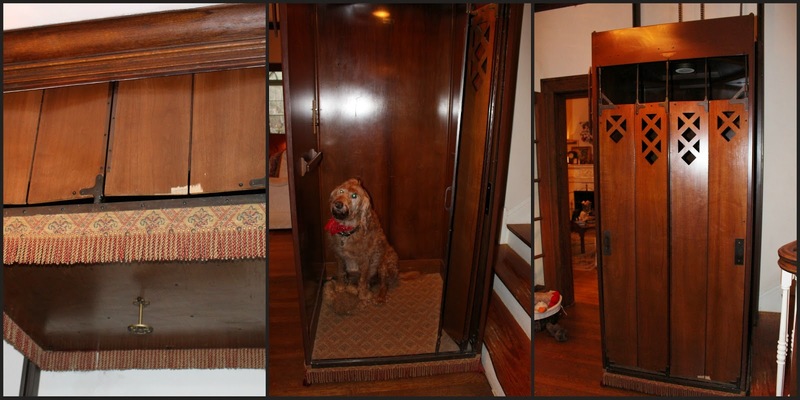 Every room expresses the love these homeowners have for this house, the past, and their own heritage.